They never made a movie about Maximus’ reign over Rome. Because there is no fun in foregone conclusions. It’s the same reason the petulant Commodus drops a blade into his ribs prior to the final battle: the outcome, for optimal entertainment, must be in question. Which is precisely why we love March Madness. Sure, there are favorites but the brevity of a single game and the immediacy of defeat – or victory – are the most thrilling of events. We love one and done (see the aforementioned Gladiator). 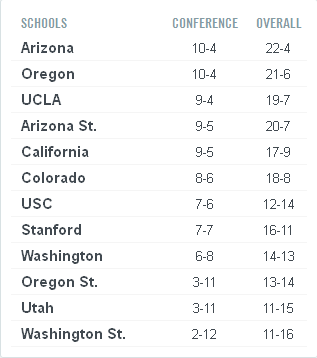 Arizona and Oregon sit atop the conference (Oregon holding the tie-breaker) with UCLA on their half-game heels and Cal/ASU a game out. Which is where things get interesting. Cal holds the tie-breaker over UCLA, Oregon, and Arizona. They’ll need some help in holding ASU off but what I’m ultimately getting at is we have arrived at one and done time. It’s a race a race to four wins (five if you’re UCLA) and by the looks of it I don’t think we’re going to get to escape the rulebooks here. 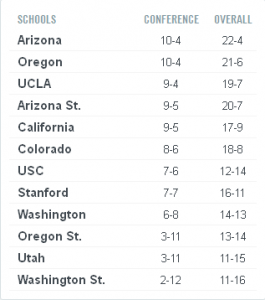 Neither Oregon or Cal has any games remaining against these contenders, letting Arizona, ASU, and UCLA beat up on one another right until the final day. Lose a game down the stretch a bid your title hopes, sayonara! Of course should Oregon win out, the conference title is theirs. But this is no foregone conclusion which, as stated above, is the precise recipe for optimal entertainment. And the question therefore becomes: Of these squads, who do you most like to win out? For my money, it’s Arizona. But I can’t dismiss UCLA and I’ll reiterate that Cal has a fighting chance to win the Conference of Champions. And Oregon is ultimately still holding their own destiny in Dominic Artis’ boot. UCLA @ USC, 2/24. 12:30pm, FSN – Rivalry. ASU @ UCLA, 2/27, 8:30pm, P12N – Revenge. Arizona @ UCLA, 3/2, 6pm, ESPN – I’m going. Stanford @ Cal, 3/6, 8pm, ESPN2 – Rivalry. Oregon @ Colorado, 3/7, 6pm, ESPN2 – Revenge. ASU @ Arizona, 3/9, 1:30pm, FSN – Pure spice.